Ruha Benjamin. A New Jim Code? From everyday apps to complex algorithms, technology has the potential to hide, speed, and even deepen discrimination, while appearing neutral and even benevolent when compared to racist practices of a previous era. In this talk, I present the concept of the “New Jim Code" to explore a range of discriminatory designs that encode inequity: by explicitly amplifying racial hierarchies, by ignoring but thereby replicating social divisions, or by aiming to fix racial bias but ultimately doing quite the opposite. We will also consider how race itself is a kind of tool designed to stratify and sanctify social injustice and discuss how technology is and can be used toward liberatory ends. This presentation takes us into the world of biased bots, altruistic algorithms, and their many entanglements, and provides conceptual tools to decode tech promises with sociologically informed skepticism. In doing so, it challenges us to question not only the technologies we are sold, but also the ones we manufacture ourselves. 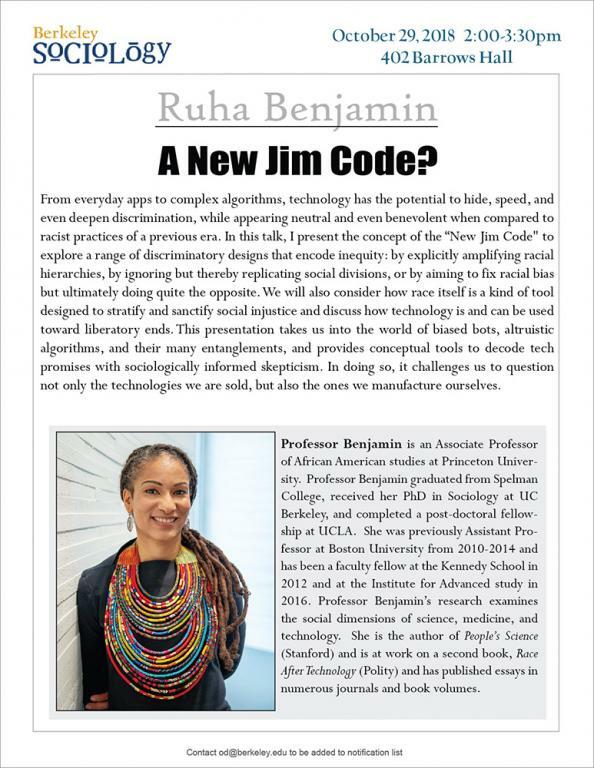 Ruha Benjamin is an Associate Professor of African American studies at Princeton University. Professor Benjamin graduated from Spelman College, received her PhD in Sociology at UC Berkeley, and completed a post-doctoral fellowship at UCLA. She was previously Assistant Professor at Boston University from 2010-2014 and has been a faculty fellow at the Kennedy School in 2012 and at the Institute for Advanced study in 2016. Professor Benjamin’s research examines the social dimensions of science, medicine, and technology. She is the author of People’s Science (Stanford) and is at work on a second book, Race After Technology (Polity) and has published essays in numerous journals and book volumes.